4" square extruded heavy wall aluminum uprights designed to withstand coastal winds and weather. Adjustable winches for play at any height. Includes ground sleeves, installation tool, 2 winches and weather resistant net. Limited Lifetime Warranty on uprights. 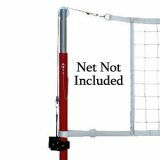 Collegiate Net Volleyball Center Package with Classic Steel Uprights with 16 Pin Stop height adjustment range from 6'6" to 8'2"
3" Classic Steel Collegiate Center package added to the 3" Classic Steel Collegiate System (PVB-1500) allows a two court set up using a common center pole. Package includes center pole, worm drive winch, Flex Net and upright pad. Specify pad color when ordering. Collegiate Net Volleyball System, Center Package, Durable Steel uprights with 16 Pin Stop height adjustment range from 6'6" to 8'2"
3-1/2" Steel Collegiate Center package added to the 3-1/2" Steel Collegiate System (PVB-1500) allows a two court set up using a common center pole. Package includes center pole, worm drive winch, Flex Net and upright pad. Specify pad color when ordering. Designed for International, Collegiate and High School Level. Durable steel uprights with 16 Pin Stop height adjustment range from 6' 6" to 8' 2". Uprights are designed to fit 3-1/2" diameter sleeves. Includes worm drive winch. 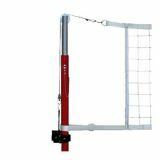 Collegiate Net Volleyball System, Including Classic Steel uprights with 16 Pin Stop height adjustment range from 6'6" to 8'2"
A budget friendly system. Designed for International, Collegiate and High School Level. Durable steel uprights with 16 Pin Stop height adjustment range from 6' 6" to 8' 2". Uprights are designed to fit 3" diameter sleeves. Uprights feature powder coated finish. System includes uprights with worm drive winch, patented Flex Net, upright padding and antennae. Floor sleeves sold separately. Specify pad color when ordering. 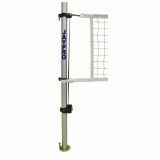 Collegiate Volleyball Net System including Durable Steel Uprights with 16 Pin Stop height adjustment range from 6'6" to 8'2"
A budget friendly system. Designed for International, Collegiate and High School Level. Durable steel uprights with 16 Pin Stop height adjustment range from 6' 6" to 8' 2". Uprights are designed to fit 3-1/2" diameter sleeves. Uprights feature powder coated finish and durable recessed polymer pulley wheel. System includes uprights with worm drive winch, patented Flex Net, upright padding and antennae. Floor sleeves sold separately. Specify pad color when ordering. 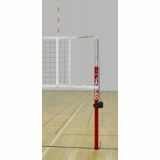 Collegiate Volleyball Net System, Classic Steel Uprights with 16 Pin Stop height adjustment range from 6'6" to 8'2"
Designed for International, Collegiate and High School Level. Durable steel uprights with 16 Pin Stop height adjustment range from 6' 6" to 8' 2". Uprights are designed to fit 3" diameter sleeves. Uprights feature powder coated finish. Includes worm drive winch. 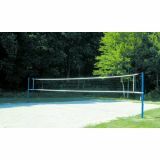 Center package for a two court set up if paired with the Outdoor Competition system. 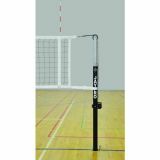 Easily converts from a competition volleyball system to a badminton or tennis system by adjusting the sliding collars. 3-1/2" O.D. Anodized aluminum uprights. Designed for High School, Intramural and Recreational Competition. 10 year Limited Warranty on uprights. System includes uprights with worm drive winch, patented Flex Net, upright padding and antennae. Specify pad color when ordering. 3-1/2" O.D. powder coated steel uprights with fixed height for men's and women's play. Includes rust resistant ratchet and 36" aluminum ground sleeves with top caps. Nets available separately. 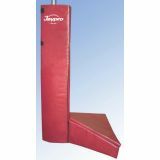 Replacement base pad for 2nd floor competition systems only (PVB-2500 and PVB-2700). Specify pad color when ordering. Designed for where floor sleeves are impractical. 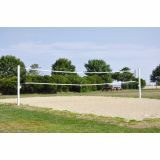 The strong base design and world class uprights provide top level performance without the use of cables or wires. Meets all NCAA, NFHS and USVBA specifications. Designed for Collegiate and High School Level. Uprights feature durable recessed polymer pulley wheel and Infinte height adjustment range from 6' to 8' 2". 3-1/2" O.D. 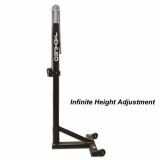 Aluminum uprights fit into steel T-bases and are secured with hand knob assemblies to floor anchors. Floor anchors are sold separately. System includes uprights with worm drive winch, patented Flex Net, upright and base padding and antennae. Specify pad color when ordering.